Day three of the Coast to Coast walk requires a walker to make one or two decisions regarding route and destination for an overnight halt, as it is possible to reach Patterdale via a number of routes after climbing out of Borrowdale to the summit of Greenup Edge, each one varying in distance and difficulty. 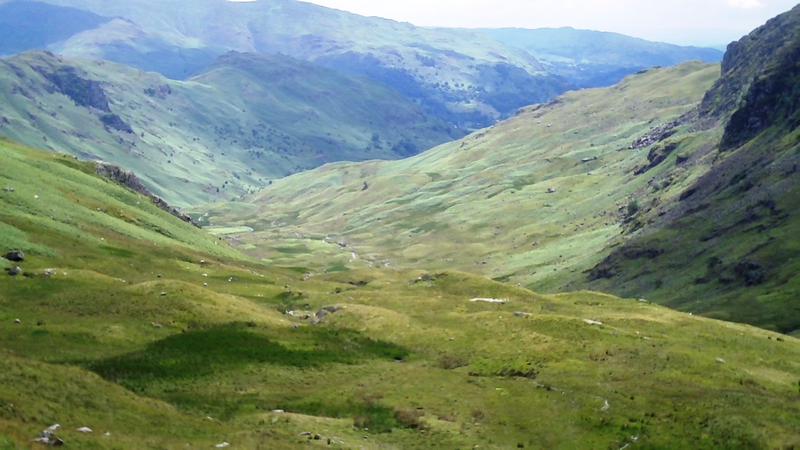 A common choice however is to descend into Far Easdale and stop in Grasmere for the night, thereby splitting the section in two, which is what we opted for. After a discussion at the campsite the previous evening, we had decided on a shorter day as we had found the previous section quite tiring and the following three days were all long, hard ones. As we were under no time constraints by splitting the third day into two, we would give ourselves breathing space for the two long hard days to Shap and Kirkby Stephen that followed. Also, the weather outlook was bad, with heavy rain forecast but as we packed up, the sun was shining and it was a beautiful morning in Borrowdale as we headed to the village of Stonethwaite in good spirits. From the village, we crossed Stonethwaite Beck and began the climb to Greenup Edge in the shadow of the imposing Eagle Crag. 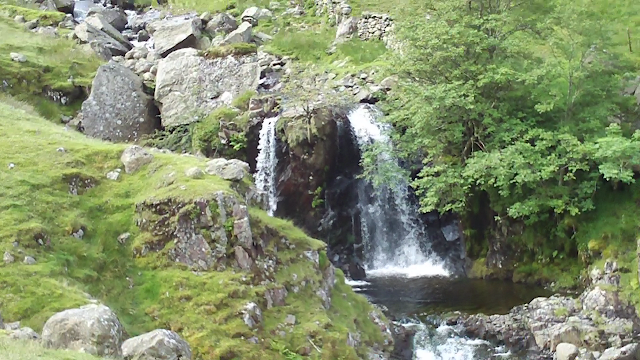 I remembered this section well from thirteen years earlier as it is such a glorious walk in the company of the beck, which creates impressive waterfalls as it tumbles down the mountainside. As we climbed, the need to stop for breath became more regular and as we looked back down to the bottom of the path we could see the ant-like figures of other walkers following us up to the top. As we stood and watched we noticed that one figure appeared much taller than the others and seemed to be leaning like a drunk in a hurricane. 'That's Brian', we both chimed, as we observed the slightly comical figure lurching up the path towards us. As we continued, I recalled from my earlier trip that on nearing the top, the path becomes almost vertical as it heads for the summit of Lining Crag. We had been climbing fairly quickly and by the time we reached the foot of the summit path, we were feeling the pace so we took a break to contemplate the steep climb from the base of the 'ladder-like' path. As we sat and snacked on chocolate bars, father and son duo Charlie and Phil came into view, closely followed by Brian listing dangerously to port. The five of us sat for a few minutes and discussed the onward route up the wall of rock before us and as we resumed our climb, were surprised to find that it wasn't half as bad as it looked. The rest break at the bottom had obviously paid dividends and we skipped across the bogs on the top before heading down towards the head of Far Easdale. Despite the forecast, the weather had been fine and although it looked as though our luck was about to run out, when there had been some threatening cloud on the summit of Lining Crag, it was still fine as the five of us descended to Grasmere. The going down the valley was fairly easy and we stopped for a break part of the way down and discovered that our three companions were carrying on to Patterdale, so probably still had around ten miles to go including another climb over the Grisedale Pass, similar to the one we had just done over Greenup Edge. This meant that after today, we were unlikely to see them again, which was a little sad. As we approached the outskirts of Grasmere, we reached the point where we were to part company and shook hands with Charlie, Phil and Brian and wished them luck with the rest of the walk. As they turned off of our route, we had one last glimpse of Brian doing his sinking yacht impression and then turned to arrive suddenly in the main street of Grasmere. I have to say that I didn't like Grasmere. I accept that it's a very pretty Lake District village but for me it was just too touristy. Everywhere was twee little teashops and giftshops selling mostly useless rubbish and Beatrix Potter paraphenalia, which for some reason the Japanese find fascinating. The place was crawling with them snapping away as their companions stood in front of some Peter Rabbit inspired tourist tat, gormlessly grinning into the lens. I hated it and wanted to get away. We saw a sign for bed and breakfast and underneath in very small lettering it said 'from £74 a night'! That was it, we caught the bus to Ambleside. I know Ambleside quite well as I usually base myself there when in The Lakes. After a short bus ride of around ten minutes, we alighted from the bus in the centre of the town over £6 poorer and started looking at the numerous guesthouses on offer. 'We might struggle to get a room for one night only at the weekend', I said to Alan optimistically. We rang the bell on the first one showing a vacancy sign and within minutes were unpacking our rucksacks in our newly acquired room. So much for my career as a fortune teller! It was quite small and up three flights of stairs but as we started sorting out our gear and getting showered the heavens opened outside. It rained on and off all night so the decision to use a B&B had seemed like a good one.